Tableau: the Solitaire game is played with a complete deck of cards (52 of them), of which 28 are dealt over 7 columns. The first column has one card and each subsequent column has one more. All cards are face down except for the top one. Stock pile: the 24 cards that have not been dealt on the tableau are put on the stock pile. Waste pile: here a card drawn from the stock pile is dealt one at a time. 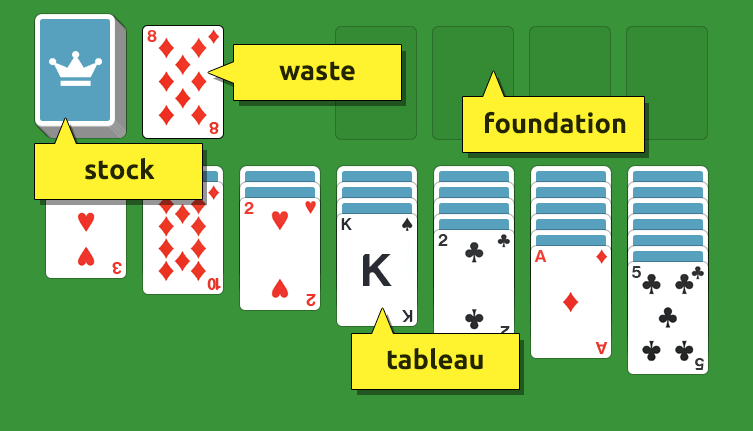 Foundation: This is where the cards from the tableau are stacked. This will become clearer below. The Solitaire game has started and we will first focus on the tableau. As we already know, we have to try to move all the cards to the foundation, where each stack has to start with an Ace. So, first we'll look for the Aces. As you can see in figure 1.1, there is a diamond Ace in column 6, which is good news because we can clear our first card. 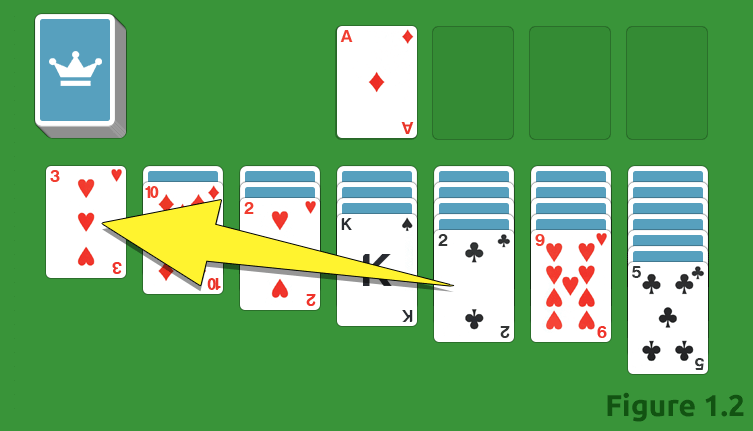 The card below this Ace is turned over automatically. 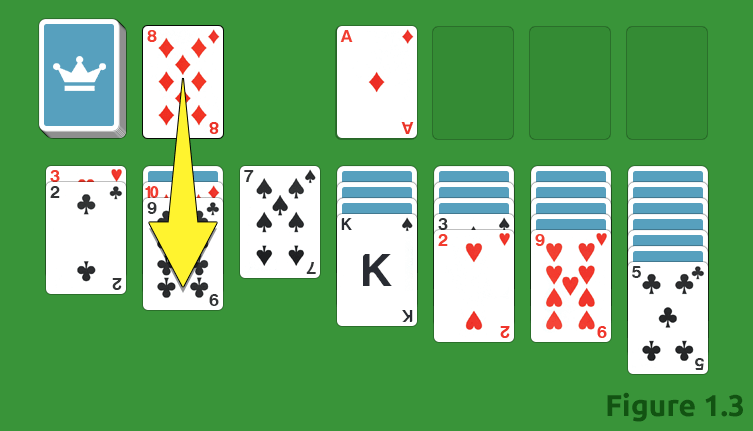 Once we can't find any more Aces, we sort the cards in the right sequence in order to turn more cards face up while we play. 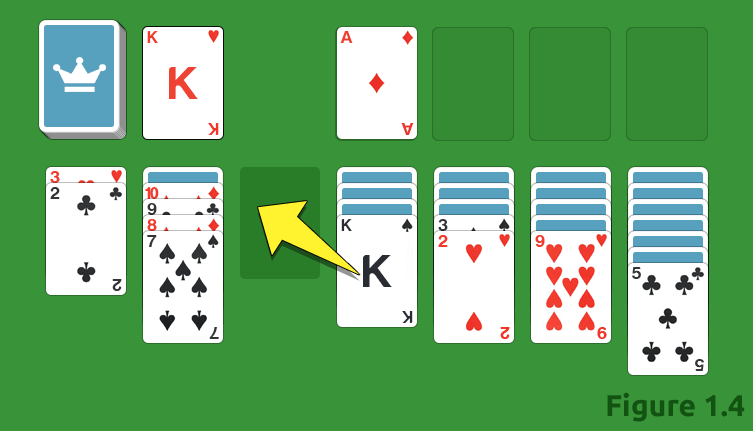 According to the rules of Klondike Solitaire, the cards on the tableau can only be sorted in alternating colors, putting each card on another card with a value that is one point higher. In figure 1.2, we see a black 2 in column 5, which, according to the rules, fits perfectly on the red 3 of hearts in column 1. And so we continue until we run out of possibilities. Next, we dig through the stock pile until we find a card that we can use on the foundation or on the tableau. You do this by repeatedly pushing or clicking the stock pile. As you can see in figure 1.3, we found a red 8 in the stock pile, which we can put on the black 9 in column 2. We can then immediately put the black 7 from column 3 on the red 8. This takes us straight to the next rule of the game: empty spaces on the tableau. As you can see in image 1.4, when the 7 was moved, an empty space was created on the tableau. 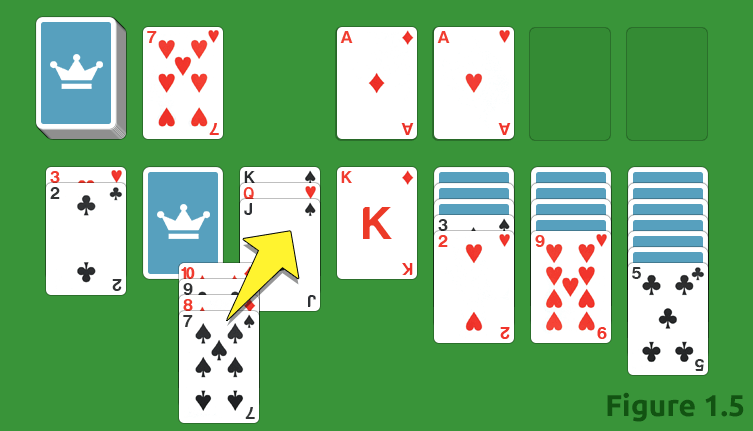 According to the rules of the Solitaire game, you are only allowed to place a King here. So, we can put the King from column number 4 in this spot. We then go through the stock once again to see if we can find new possibilities and continue until all the cards have been moved to the foundation. It is also possible to move more than 1 card at once, so it is important that you look for this when you are looking for new possibilities. For instance, in figure 1.5, the stack of column 2 can be moved as a whole to the stack in column 3 because the red 10 fits on the black Jack. For a card that you move from the waste to the tableau you get 5 points and when you move a card from the waste or the tableau to the foundation, you get 10. When you turn over a card, you get 5 points, which means that if you play a card from the tableau to the foundation and turn a card at the same time, you get 15 points in total. There is also a time bonus, which is calculated based on a special formula that divides the number 700,000 by the number of seconds you took to resolve the game. This bonus is added to the number of points scored. If you complete the game within 30 seconds, you do not get any bonus points. The rules above also apply when you choose to play with 3 cards instead of 1, with the only difference being that not all the cards from the stock will be available. This is because the stock pile deals 3 cards to the waste pile and you can only move the top one, after which the second card moves to the top spot. You can use this to determine which cards can be played, which is definitely a real brain teaser. 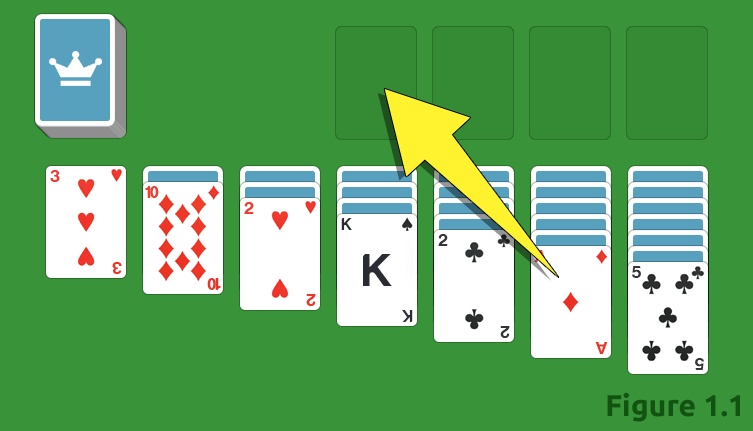 We made a list of useful Solitaire strategies that allow you win even faster, so read through these carefully and you'll see that your game will improve in no time at all.